Investors expecting bond funds to perform as well in the next 10 years as they have in the last 10 will be disappointed. Bonds can play an important role in investor portfolios, reducing volatility and increasing the predictability of returns. However, the stellar performance of bond funds -- especially longer-term funds -- as yields have declined over the last 30 years will not be repeated anytime soon. Not only that, there is even the risk of negative returns. 10-year U.S. Treasury Note rates, plotted monthly; prior to 1953, they're the less granular. Note: The graph has been updated through 2012. While the statistics below do not fully reflect market performance since the original publication date. I think the main points in the original analysis are still relevant. For the most recent 10-year rates, see the March, 2013 Market Update. Since 1900 yields have ranged from a little less than 2%, to 15.3%; the average rate was 4.9%. However, the left hand side of this graph clearly represents a different world from the right hand side. Somewhere between the mid-50's and the mid-70's, rates became much more volatile. From 1900 through 1959, interest rates ranged from the all-time low of a little less than 2.0% in 1941 to a high of 5.1% in 1921 -- a range from low to high of only 3.1%; the average rate was 3.3%. Since then, the range has been from the December 2008 financial panic low of 2.4% to the September 1981 "all-time" high of 15.3% -- a range of almost 13%; the average rate during that period was 6.7%. The outstanding feature of this graph is clearly the 50 years beginning around 1960. During this period, we have seen yields go from less than 4% to more than 15%, and back again. The average rate has doubled, from 3.3% to 6.7%, and the range of rates has quadrupled! 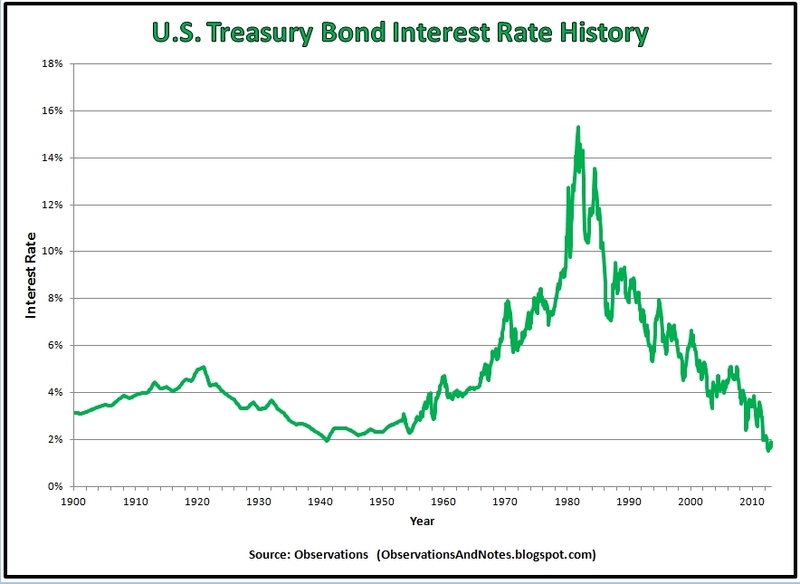 Are interest rates normally as consistent as they were from 1900 to 1960? Or, is the boom-bust cycle afterwards more typical? It's difficult to tell from this graph. What is clear is that "recent" history could seriously mislead investors who evaluate investment prospects by looking at the last 3, 5, 10, or even 25 years. Interest rates have declined more or less steadily for the last 30 years, from more than 15% to less than 3%. Falling yields are great for bond investors -- especially those buying intermediate or long-term bonds. These buyers receive higher than prevailing rates, and/or they benefit from appreciation in the price of their bonds caused by the falling rates (see Yield to Maturity & Interest Rate Risk). Unfortunately, the returns that bond funds provide when rates are falling from 15% to 3% cannot be repeated if interest rates are already at 3%! In October 2010, the yield on 10-year Treasury Notes was 2.54%, not far off the 2.4% low set during the financial panic near the end of 2008. These are historically low rates. To find comparable rates, you have to go back more than 50 years, to 1954. 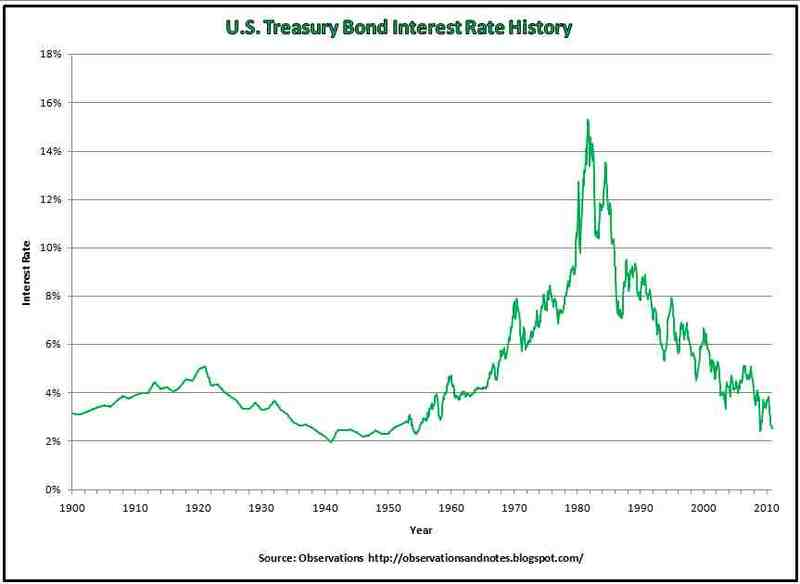 Even in the pre-1960 world, these would be below average interest rates. Because of the relationship between yield and bond price, near all-time low interest rates mean near all-time high bond prices. It's a near certainty that bond prices can only go down from here -- though it won't necessarily happen immediately. As a result, not only are investors in intermediate and long-term treasury bond funds less likely to continue to benefit from falling rates, they are likely to see price decreases when rates increase. How much impact could that have? Just to make the point (i.e., this is a completely hypothetical example), consider if 10-year interest rates were to immediately increase from 2.5% to the "100-year" average rate of 4.9%; holders of new bonds would see a price decrease of almost 20%. An increase to the more recent average of 6.7% would translate into a price decrease of closer to 30%. Fund flows into bond funds have increased dramatically over the last two years. Investors in intermediate and long-term funds expecting a repeat of "recent" performance will be disappointed. Those seeking "safety" -- to avoid risk -- may well be equally disappointed. The out-performance of bonds over the last 10 (or 30, or ...) years does not mean that bonds are a better investment than the alternatives that they out-performed, only that bonds at the right price are. How often have rates been below, say, 3%? See Analysis of 10-year Treasury Note Interest Rate History. It presents interest rate history as a histogram (frequency chart), and considers the potential impact of interest rates on the stock market and real estate. We are experiencing the lowest interest rates in U. S. history -- even lower than they were during the Great Depression. On July 25, the U.S. Department of the Treasury 10-year constant maturity series closed at a new all-time low yield of 1.43%. Why Did My Bond Fund Lag When Treasuries Rallied? discusses the difference in the impact of the falling rates on treasury returns vs. intermediate bond fund returns. For an additional discussion of "duration," see related materials below. Where Are Interest Rates Headed? My unique methodology for forecasting interest rates. 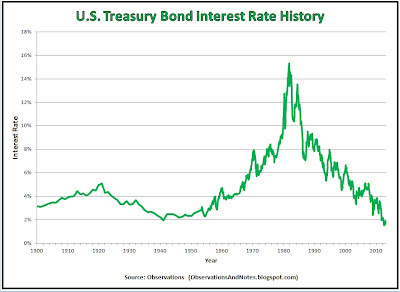 Analyzing Treasury Interest Rates since 1900: historical likelihood of yield being above/below 2%, 3%, 4%, etc. ; potential impact of rate changes on stock market & real estate. 10-Year T-Note Real Return History calculates the inflation-adjusted returns for hypothetical investors buying the same bonds used for the graph in this post. 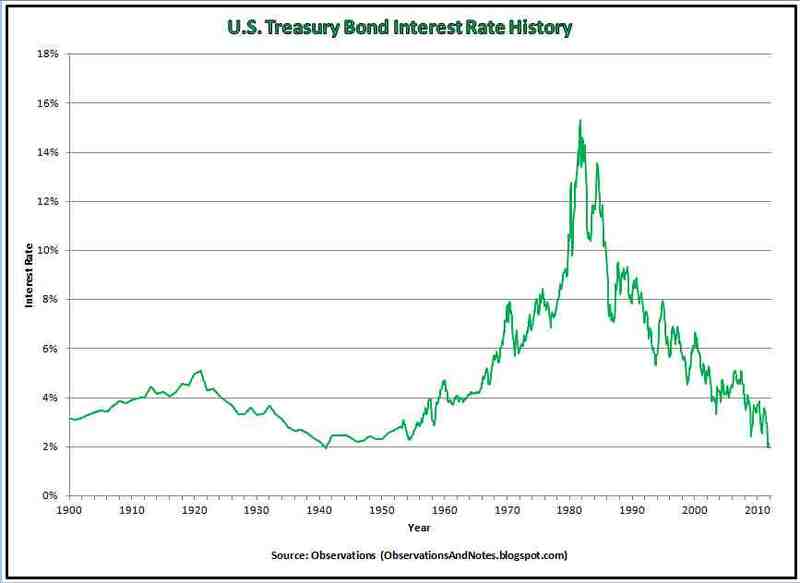 Why Treasury Bonds Look So Risky Right Now: April 2012 article from Morningstar. Yield to Maturity & Interest Rate Risk: for more on how to calculate the impact of rising interest rates on bonds. The Importance of Duration: for more on the impact of changing interest rates, and how to estimate their impact. 100 Years of Inflation Rate History: an overview of the impact of inflation. 100 Years of Real Estate Price History: Shiller's housing price index history, plus intro to the economics of real estate. 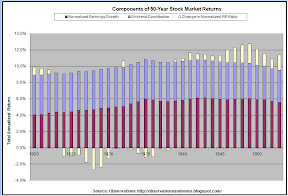 100 Years of Stock Market History: Similar perspective as this post on stock market. Pre-1953: Robert Shiller "Irrational Exuberance" data, compiled based upon Sidney Homer's "A History of Interest Rates." 1953 forward: U.S. Government 10-Year Treasury Constant Maturity Rates (GS10 series). Current U.S. Interest Rates: for the most recent rates for U.S. Treasuries from 1 month to 30 years. For lists of other popular posts and an index of stock & bond-related posts, by subject area, see the sidebar to the left or the blog header. To share via Facebook, Twitter, etc., see below. good article..I really appreciate it and you have shared very valuable blog. We can utilizetion and i would like to thank to you a lot for sharing this. could you please name the source of the data? I would really appreciate it as I need it for my research. WOULD IT BE SAFE TO ASSUME THAT "BAD NEWS" SUCH AS A NATIONAL DEBT DEFAULT WOULD CAUSE LOWER 10 YR BOND YIELDS ? AND CONVERSLEY, "GOOD NEWS" SUCH AS NOT DEFAULTING, AND CONGRESS AGREEING ON LONG TERM DEBT REDUCTION, WOULD CAUSE HIGHER 10 YR BOND YIELDS ? Actually, it's the reverse. Increasing risk of default would result in lower bond PRICES; investors would be reluctant to own the bonds, and this would drive prices down. Lower prices means HIGHER bond yields. Investors would demand higher yields to motivate them to buy bonds which they would perceive as riskier than US Treasuries have traditionally been. This is exactly what is happening now in, e.g., Greece. Today, 10-year Greek sovereign debt yields about 17.5% compared to about 2.9% for comparable U.S. debt. You opine as follows: "Unfortunately, the returns that bond funds provide when rates are falling from 15% to 3% cannot be repeated if interest rates are already at 3%!" Logically speaking, your claim is not true, especially for long-term bonds. To keep the math simple, consider "perpetual bonds" that have infinite maturity. (The British government has financed part of its government debt via such bonds for centuries. See the Wikipedia article http://en.wikipedia.org/wiki/Consol_(bond) .) In that case, the bond's interest rate is just the dollar amount paid annually divided by the bond's market price. The market price and the interest rates are related exactly inversely, so a halving of the interest rate definitionally implies a doubling of the market price of existing perpetual bonds. Or, considering your historical numbers, a further reduction in the interest rate to (3/15)3% = 0.6% would imply another five-fold increase in market price. For bonds with finite maturities, the interest rate would have to fall by a greater percentage, but a five-fold bond price increase is still a logical possibility. You're right of course. Theoretically, we COULD see rates go to 0.6%. It's just that a reduction from 15% to 3% is MUCH more likely than a reduction from 3% to 0.6% -- especially since the record low is apparently not much below 2%. "Or, considering your historical numbers, a further reduction in the interest rate to (3/15)3% = 0.6% would imply another five-fold increase in market price." I thought this exact same thing when reading the article. Is it possible for the LT treasury to reach 0.6%? Yes. Is it likely? Difficult to say, however it is quite in the realm of possiblity to see 30yr rates move to 2.0% or lower. Consider Japan's 30 yr LT bond yields at today's level of 1.89% and a lows in the 1.5% range; 10 yr Yields for Japan are currently at .92%. With this light, it gives us a different perspective. It is interesting to see how yields have dropped substantially from the time of this post. I think this is further evidence that the bond market is not something that one can expect to time, especially when it comes to their life savings. Investors who recognized that long bonds are a great diversifying tool profited handsomely while reducing their risk profile. I have no idea what rates are going to do in the future, but I am confident that long-bonds will continue to have low correlation with the stock market so I will continue to hold, irrespective of speculations. It sounds like you are holding bonds, not bond FUNDS. I have no issue with bonds -- as long as you're planning to hold to maturity; in that case, you have no price risk. The issue is the risk/reward inherent in bond funds. Can rates continue to go lower? Of course, they can. However, bond fund holders need to understand that the risk/reward is distinctly different when interest rates are at 3% (or lower) from what it was when rates were at 15%. The tide is turning... secular BEAR market in it's infancy? 4 years ago I asked, is the tide turning? Now in early 2017, the news is a lot more quiet on the front... with a 50/50 mix of pro bull and pro bear... interesting whats going to happen.. I'm looking forward to the process ahead... whatever that may be... have your money management on strong and prepare for the ride!